This is the first of a four-part series that will help you design a successful mentoring program. Everyone has their own ideas about mentoring and expectations can differ wildly. Unrealistic expectations about what mentoring can or will do – on an organisational or individual level – can leave people disappointed, disillusioned and disengaged. 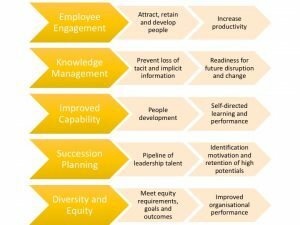 Managers need to manage, lead and develop their staff. Mentoring skills help them do that and most mentoring programs provide people with an off-line mentor (someone not in a direct line of authority) for personal, self-directed professional and career development. Mentoring, by a manager or an off-line mentor, amplifies learning. It complements training and education as well as on-the-job learning. 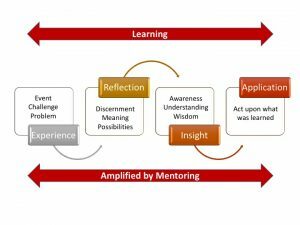 Mentors enable mentees to reflect, gain insight and apply learning. Mentoring supports women, minorities or disadvantaged people and can help them advance in the workplace. But equity is a structural and cultural issue that must be addressed by changing practices and behaviours that cause disadvantage and disempowerment. The timeline below offers a guide to the design process. 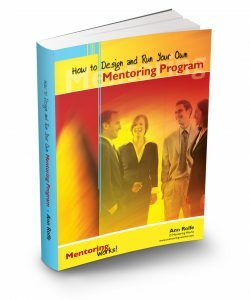 You need to begin by discovering why your organisation wants or needs a mentoring program. Discuss your organisation’s strategic priorities with senior decision makers. What are they hoping mentoring will achieve? Are their expectations realistic? 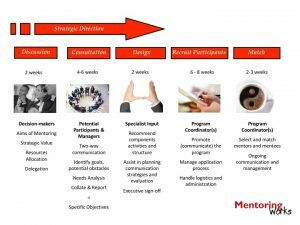 Is mentoring the right strategy? Will other interventions be required to achieve the aims? Once you have the strategic direction agreed with senior decision-makers you can proceed to the next step: needs analysis and consultation with potential participants. 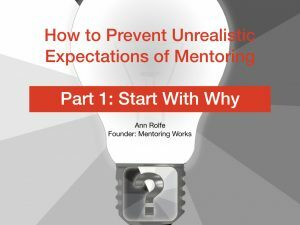 Now read How to Prevent Unrealistic Expectations of Mentoring Part 2: Needs Analysis and Consultation. Reviewing or evaluating your mentoring? Want ideas and information to support mentoring? What you need is at your fingertips now in the best value package ever. 20 years experience and award-winning programs are reflected in these products. The package includes 1 manual, 6 e-books and 27 webinar recordings with new ones added each year. Details here. ← Does Mentoring Girls in STEM work?